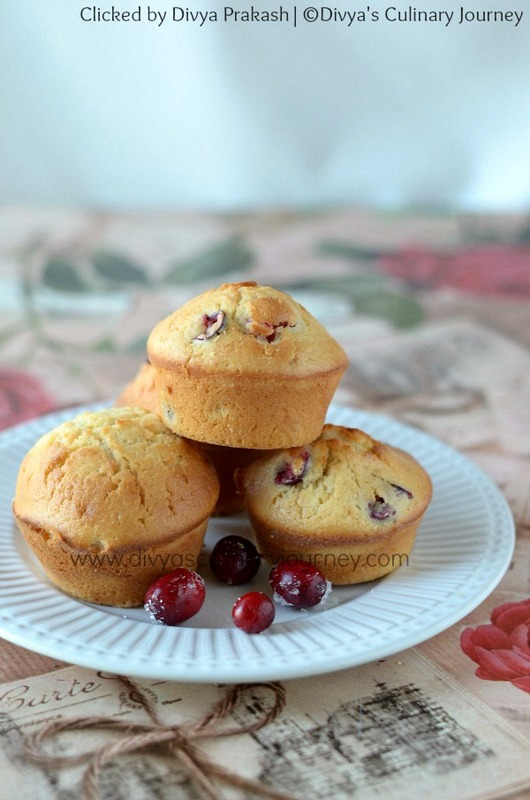 These soft and delicious muffins are made with fresh cranberries. They can be had for breakfast or as a teatime snack. Preheat the oven to 350F/ 180C / 160 Fan / Gas Mark 4. Prepare the muffin pan by greasing and flouring it. In a bowl, beat butter till it is fluffy, then add sugar beat well, then add eggs one by one and continue to beat. Then add yogurt, milk and vanilla extract and mix well. In another bowl, sift together all purpose flour, baking powder and salt. Add the flour mixture little by little to the butter mixture and mix till they are well combined. Cut the cranberries into half. Toss them in a tablespoon of flour and add then to the batter and mix such that they are evenly distributed in the batter. Pour the batter in the prepared muffin pan such that they are slightly over 3/4th of each cup. Bake for about 20-25 minutes till they are done. Remove from the oven and let it cool for 5 minutes then remove them from the pan and then let it cool completely and serve them. Baking time varies with each oven. Muffins were ready in about 22 minutes in my oven. If fresh cranberries are not available, you can use frozen cranberries, thaw and use them or you can use dried cranberries too. Optionally, You can also add some nuts like almonds, walnuts, pecans etc along with the cranberries. I love cranberries too but never had them growing up in England, it wasn't until I moved to the U.S I tried them. I'd love to make these muffins, wish I had a couple right now for breakfast. I have some cranberries in my fridge from the holidays, I bet just the right amount too - can't wait to give this recipe a try! Perfect for breakfast and looks so delectable! We're big fans of cranberries in our house too, and you're right, they're not readily available in the uk. I usually buy extra at Christmastime for the freezer. My mouth is watering thinking of this recipe - gorgeous! Cranberries are so delicious, and I don't think people use them enough. Thanks for the recipe, because I can't wait to try it! Yum! I think I will make these for my family for Valentine's Day! These muffins sound so tasty especially for wintertime! These muffins look delicious. I need these with my coffee. I love muffins with fresh cranberries! The best snack along with a cup of warm chocolate! 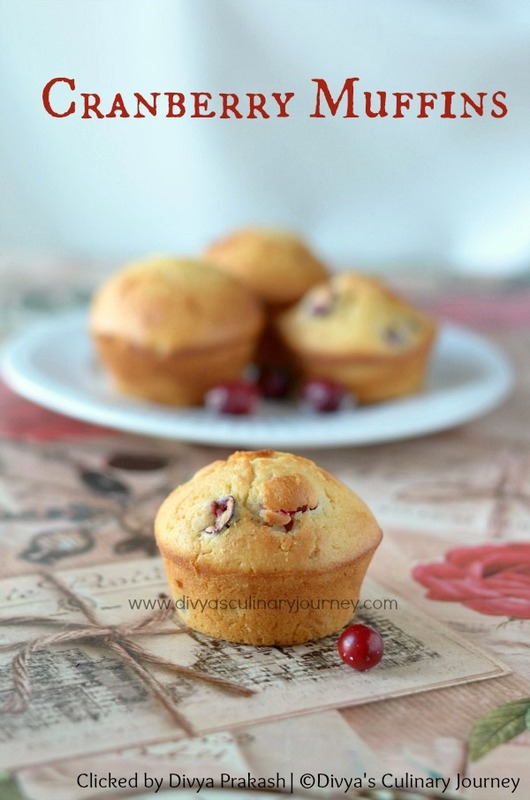 I too recently baked Cranberry Min Bundt cake but with dried ones, should try this fresh cranberry muffins soon...looks so yumm n moist. Nice clicks too! Nice clicks.. The muffins look so yummy..